Editor's Summary: Everyone encounters difficult people, and experiences the frustrations of interacting with them. But frustration, and the outcomes of conversations with difficult people is at least partially under YOUR control. By learning and applying various difficult and annoying people tips and strategies you can make your life easier, and have less problems. 1.Listen more effectively. Listening is the number one tool in communication, especially when dealing with difficult people. 2.Step back and analyze the situation from an outside perspective. When we are less emotionally involved and "cool our jets," the answers come for how to effectively deal with them. Whether dealing with a difficult boss, dealing with a difficult co-worker, or spouse. 3.Ignoring often doesn’t work. The tension becomes so thick you can cut it with a knife. 4.Choose your battles. There are times when you have to “let it go.” Know when to speak up and when to pick your battles. 5.Criticize in person, praise in public. Never publicly criticize someone as you will look like the bad guy and the difficult person will only become more upset. 6.Maintain respect for them – even if you disagree or dislike them. At least acknowledge what they say. Think about how you would want to be treated. 7.Seek first to understand then to be understood. 8.People often won’t care what you think unless they think you care. At least attempt to see it from their perspective. 9.Maintain high expectations and standards if you are managing this employee. If you don’t do this you will be seen as enabling their unacceptable behavior. 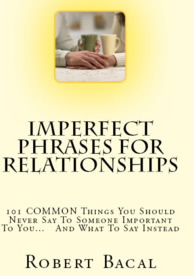 10.Strive for greater communication. Often, it’s not that there isn’t enough communication, it’s that it’s bad communication. 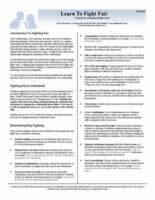 Work on improving your conflict resolution skills. 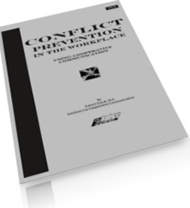 If you are a manager, consider training everyone in conflict resolution skills. One of the main reasons teams fail is because some of the people on the team don't like each other, or aren't skilled in how to handle conflict effectively. 11.Invest in communication skills courses and conflict resolution skills courses to improve the part you can control – you. 12.Don’t lose emotional control. Antagonists and “passive-aggressives” will often try to push your buttons. 13.Avoid being around difficult people when they’re in a bad mood. If they’re always in a bad mood, try being around them when they are in a “better” mood! 14.Accept, change or reject. Know that ultimately you only have three choices. 1) Accept the situation knowing it won’t change. 2) Attempt to change your relationship with them by changing how you react. 3) If it’s really affecting your well being, it may be time to “reject” the situation and move on. 15.No “but’s” allowed! Don’t follow giving them positive reinforcement with, “But on the other hand…” The word “but” only negates everything positive you just said. 16.Non-verbally position yourself at their eye level. For example, if they are sitting when you talk with them, sit. If they are standing, stand. Converse at their level. 17.Avoid the word “need” when possible and use “want” instead. Saying politely and tactfully, “John, I want to have the project in to me by noon so that we'll meet our deadline. "Want" is more assertive as long as it's in the right tone. 18.Watch your tone of voice. Avoid an autocratic or sarcastic tone. The Latin root of the word “sarcasm” is "sarco" meaning tearing of the flesh! 19.In face-to-face communication, words account for only 7% of what people notice and believe about you. Tone is 38% and body language 55%. So a full 93% is tone and body language. 20.Give sincere positive reinforcement when they do something well. Show genuine appreciation. Often difficult people are difficult because they feel unappreciated. 21.Avoid absolutes such as, “You always” and “You never.” It puts people further on the defensive. 22.Don’t take it personally. Often they’re difficult because of something going on with them. 23.Watch your mental state. Don’t let them drag you down. A little of that can be normal but don’t allow it to go on. 24.Remember the person who constantly angers you, or constantly intimidates you, controls you. 25.Mutually agree to move on. Agree to disagree. If this isn’t possible, at least “move on” in your own mind. 26.Attempt to understand what’s driving that difficult behavior. Get at the root cause, even if you only try to figure it out in your own mind. 27.E + R = 0. Event + Reaction = Outcome. You can’t control the event, but you can control the outcome based on how you react or respond. Be careful how you respond. For example, there’s the story of the couple who were divorcing. A neighbor said to the wife, "Do you think you’d ever get back together?” She replied, "No, because we have said things to each other that are so horrible, that even after apologizing they could never be taken back. There's no way we'd get back together." The moral of the story…be careful what you say. Once those words are out, they're hard to take back.